Sacred Harp singing is an aural, musical experience, but as the sheer presence of cameras at singings suggests, it is visual as well. There is plenty to see. We watch the song leaders; we glance at each other across the hollow square; the abundance of dinner on the grounds delights our eyes; and later, we rejoice in seeing images of our friends and fellow singers near and far—images provided to us by photography. There are many styles of photographic documentation of singings, with varying goals. Johnathon Kelso makes posed portraits of singers, as well as documentary photographs of singings, which have been shown in galleries and published in articles on Sacred Harp. Martha Beverly’s quite different project is to photograph each song leader at a singing, throughout the day, from her seat in the tenor section. This creates a comprehensive photographic archive of leaders—something of a visual analogue to the minutes. Of course, many of us spontaneously take snapshots of particular moments with our phone cameras. These few examples give a sense of the variety of practices we use to visually represent and remember our singing. One particular photographer got me thinking about how, and why, we document Sacred Harp visually. Last summer, I remember noticing a photo of me leading a song, taken earlier that day by Robert Chambless—a fixture at singings throughout west Georgia and Alabama along with his wife, Judy. The photo is casual. I’m in mid-motion, turning toward the basses, and am in mid-syllable as well. My immediate reaction was that this was not an ideal image of myself leading. Yet I kept thinking of it. In this picture my mouth is open because I was singing, not posing for a photograph. I was in mid-movement because I was leading a song. In the end, the photo told me a lot about the process of leading and singing—how physical it is, how enjoyable and active and exhilarating it can be. Robert often photographs his and Judy’s approach to a singing, including leaving the hotel and the scenery along the way. In this photo, a roadside sign points visitors to the singing, telling us, “we’ll soon be there.” Photograph by Robert Chambless, taken near Liberty Baptist Church, Henagar-Union Convention, July 2, 2016, Henagar, Alabama [image 5 of 420]. In addition to covering the grounds of the singing, Robert’s photographs situate the spaces of Sacred Harp in the wider world. As visitors to Big Creek know, this nineteenth-century church now sits in a decidedly contemporary landscape. 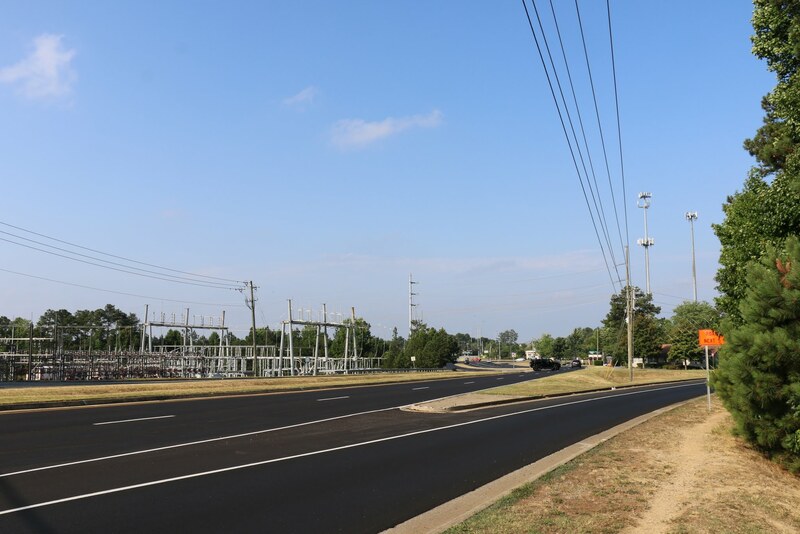 The view from the lawn is of this electric substation, which sits directly across from the very tricky left turn into the driveway—across several lanes of traffic on a newly paved road. Photograph by Robert Chambless, taken at the DeLong-Roberts Memorial Singing, June 26, 2016, Big Creek Primitive Baptist Church, Alpharetta, Georgia [image 25 of 198]. Other photos of Robert’s, reliably uploaded to his Facebook page the day of the singings, evoked similar questions. Images of singers getting out of their cars, or checking their phones; an empty serving dish after dinner; conversations with the participants half-obscured by figures in the foreground—why this image, of that moment? It occurred to me that Robert’s consistently unexpected imagery was prompting me to examine my own expectations of Sacred Harp photographs. We all treasure a well-framed image of ourselves leading in the square, or photos of our good friends at singings. These images are precious to us. But posed photographs and ideally captured moments only tell us so much. What about the rest of the day? There is so much more. How do we move through a whole day of singing? This, to me, is what Robert’s photography best captures. And it does so in very particular ways. This photo is from the perspective of Robert’s usual seat at the tenor corner of the bass section. Karen Clark is opening the singing. This is an atypical image of leading, but it is revealing: note the almost-empty front bench of tenors and altos (soon to fill up, as subsequent photos prove); the elegant framing that situates us at an exact spot on the edge of the square; the lovely spring weather visible through the open door; details such as ceiling fans and vintage clock, and the room itself: light and airy, immaculately kept, with hardwood floors. Among other things, this photo thus gives us a good idea of the likely sound quality here. 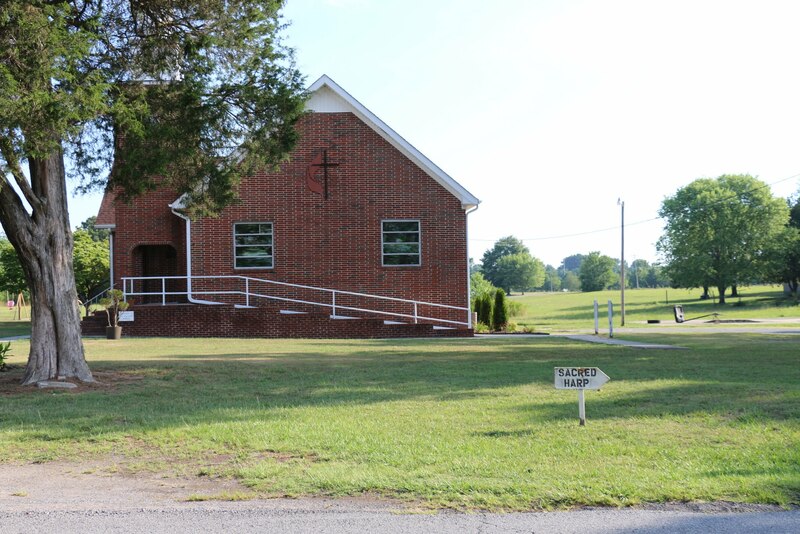 Photograph by Robert Chambless, taken at the Mount Pisgah annual all day singing, May 21, 2016, Mount Pisgah Primitive Baptist Church, Chambers County, Alabama [image 62 of 324]. Undoubtedly, Robert’s interest in these overlooked moments is part of the reason that many of his photos have their own kind of look. When we hold a camera, we subtly adjust how we look at the world. We start to frame what’s going on in front of us. This can result in powerful images. But on the other hand, it can also limit photographs to only those events which can be well-framed! Robert is interested in capturing moments that are worth preserving, but which can’t necessarily be composed as a beautiful photograph. His images thus deliberately resist customary expectations of photography. Instead of positioning the main subject squarely in the center of the photo, or neatly balancing the different elements in the frame, sometimes the image is crammed with information, or conversely it can be quite sparse. But whatever the image, his photos consistently share this quality of the unexpected. As a result, spending time with his photographs necessitates that we re-see our singing. This is characteristic of the kinds of photos taken by Robert during a recess. At first glance, the image appears a bit chaotic, with no central reference point. Looking more closely, we see a mini-conference going on in the center of the frame, with the outgoing Secretary/Treasurer (Charlene Wallace) and the new Secretary and Assistant Secretary (Lela Crowder and Donna Bell). Many conversations and interactions surround them. On the right, singers are heading out of the room, and others move in the opposite direction into the room. Meanwhile, in the foreground, solitary singers study their books. 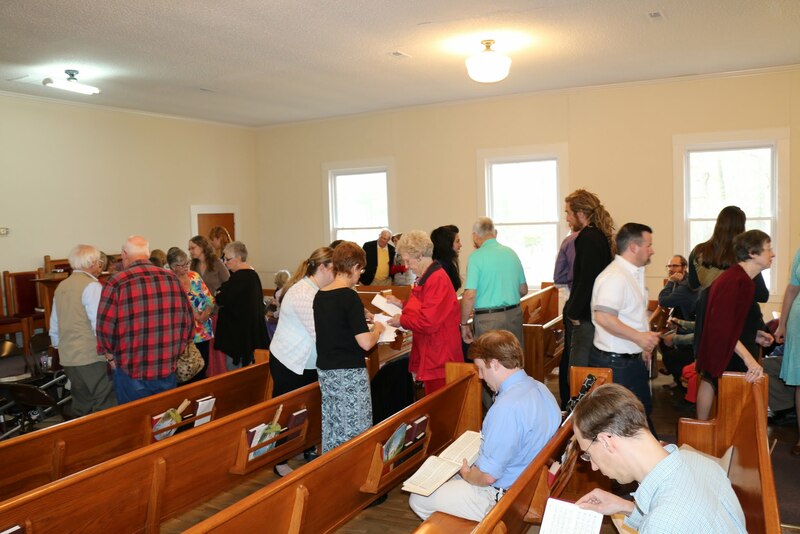 The image conveys the level and kind of activity taking place in the room, and provides us a glimpse of the many things that go on at singings—in Robert’s words, “much more than the songs.” Photograph by Robert Chambless, taken at the Georgia State Convention, March 26, 2016, Big Creek Primitive Baptist Church, Alpharetta, Georgia [image 179 of 349]. During recess, Bridgett Hill Kennedy studies her copy of The Sacred Harp. This contemplative individual portrait stands in contrast to the almost overwhelming amount of activity in the previous image. Photograph by Robert Chambless, taken at the Georgia State Convention, March 26, 2016, Big Creek Primitive Baptist Church, Alpharetta, Georgia [image 234 of 349]. Second, Robert documents the singing day in as complete a manner as possible. He and Judy are commonly the first to arrive at a singing (thus ensuring that many singers’ arrivals are documented). Images of the sunrise, roads leading to the venue, the empty parking spaces and building, gradually give way to people, and especially the many conversations and greetings that take place as we prepare to begin singing. (Looking through Robert’s photos, I was reminded just how many images he makes before the singing even starts.) Some of these photos are posed, with singers smiling; but most are very casually captured. Robert also circulates nimbly through the different spaces of a singing—as singers fill the room, we also see the dinner table gradually fill with dishes, for example. Outside details such as flying flags and Sacred Harp road signs are somehow captured along the way as well. Robert’s coverage of all the spaces of singing throughout the day, combined with his eye for the overlooked and unexpected image, results in an unusually extensive record of singings. Looking through windows and open doorways is a common motif in Robert’s photography. (After all, it’s a photographer’s job to look.) The window frame here is a double for the frame of the photograph. Its obvious presence reminds us that we are seeing from the perspective of a photographer, situated in a very particular space at a particular moment. How different this is from the sense of timelessness that a posed portrait gives. Appropriately, the action here—singers on their way to dinner—is transitory rather than still. “Our life is ever on the wing…” Photograph by Robert Chambless, taken at the Georgia State Convention, March 26, 2016, Big Creek Primitive Baptist Church, Alpharetta, Georgia [image 230 of 349]. Third, and perhaps most interesting, there is the way Robert distributes his photos to singers. He takes the opposite approach from photographers who carefully edit and show only their best images. Within a few hours (or less) of each singing’s conclusion, Robert’s entire cache of photographs appears as an album on his Facebook page—usually between two hundred and three hundred photographs, although sometimes more than four hundred images from a single singing. And they have an audience. 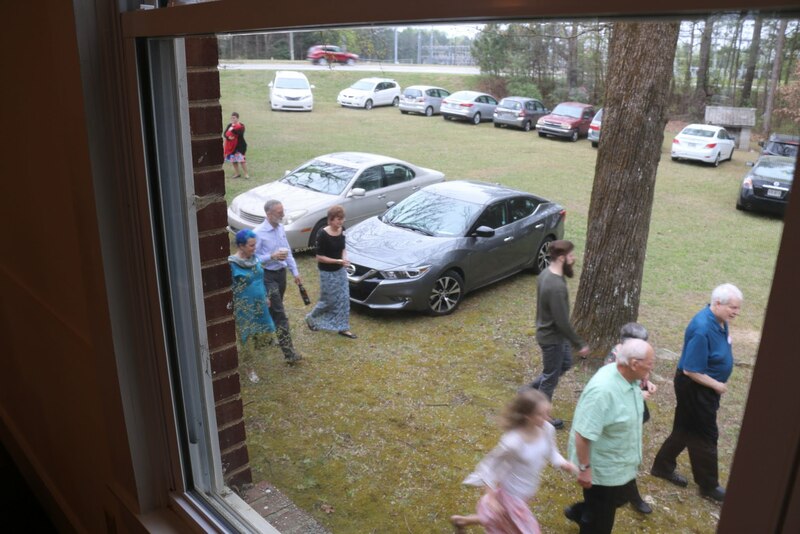 Indeed, it has become a ritual for us, carpooling back to Atlanta after a singing, to check for Robert’s photo upload—and once it’s there, to scroll through the images, which prompt conversation and often merriment. But the sheer bulk of imagery, and the completeness of the record, allows us to almost re-experience a singing directly afterward—not exactly in real-time, but certainly something closer to that than most collections of photographs afford. I remember once looking through Robert’s photos with Jesse P. Karlsberg on the drive home after a singing. Someone had spilled water on the floor inside the church that day and, being nearby, Jesse brought over some paper towels to help wipe it up. We joked, “I bet Robert took a picture of that!” Sure enough, when the pictures of the day appeared on Facebook, there was a picture of Jesse wiping up the floor! We had a good laugh about that. And I now realize that images such as these do more than merely document; they also generate conversations and memories of their own. This is a favorite image of mine. The utter lack of context about who’s holding this drill, where it’s going, or what it’s about to do, gives rise to much speculation. 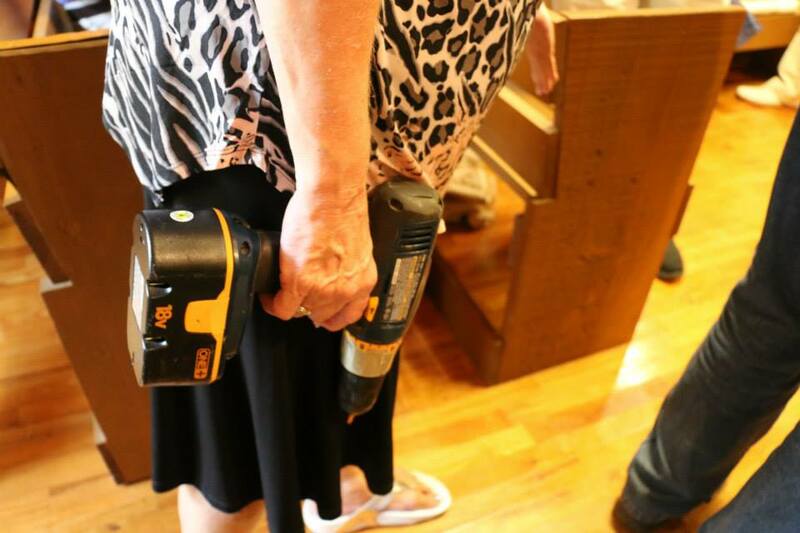 All we can be sure of is that something in Wilson’s Chapel needs fixing right away! Photograph by Robert Chambless, taken at the Chattahoochee Convention, August 1, 2015, Wilson’s Chapel, Carrollton, Georgia [image 224 of 374]. In the way that I treasure between-the-song moments that survive on some Sacred Harp sound recordings of earlier years, I have come to value Robert Chambless’s photographs of all the in-between moments, the physicality, the spills as well as the smiles, of Sacred Harp. Curious about Robert’s own attitudes to photography, I emailed him some questions earlier this year, and he graciously responded. The interview has been condensed slightly for length. How did you get started photographing? How long have you been extensively photographing singings? Are singings mostly what you photograph, or are there other ongoing subjects as well? 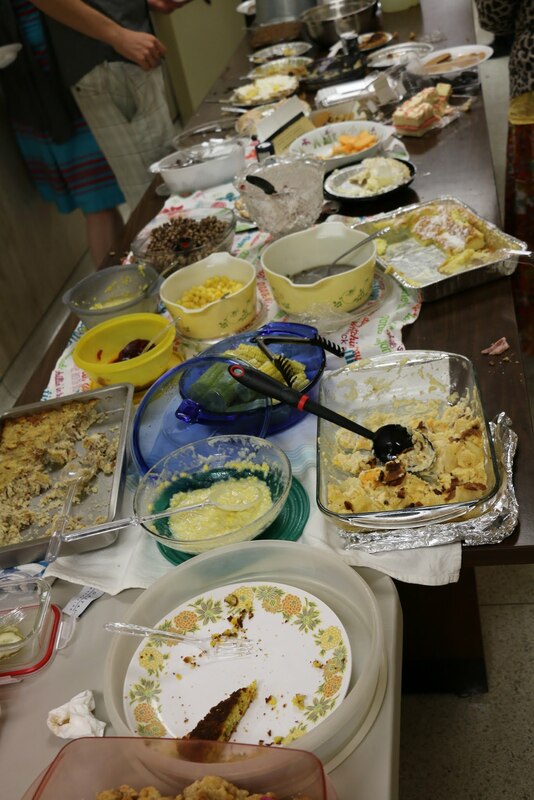 Instead of the customary still life of an elegant, orderly table, we see the aftermath: decimated casseroles, destroyed desserts, and a single piece of cornbread politely left alone. The image is of satiation as much as abundance—with the task of cleanup implied. This unglamorous portrait of dinner on the grounds is an example of the inclusiveness of Robert’s visual record of singing. 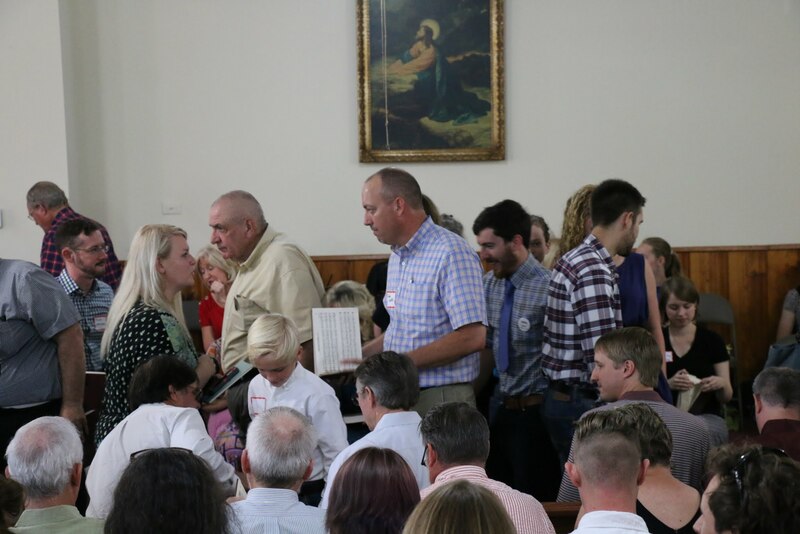 Photograph by Robert Chambless, taken at the Cullman County Convention, July 9, 2016, Cullman County Courthouse, Cullman, Alabama [image 240 of 309]. Photography has always been an interest and taking pictures myself has become a hobby after I started work as a teacher. I find photography to be a good way to share experiences with others and to help preserve memory. The cost of film pictures was prohibitive and the opportunity for sharing was limited as well; with the advent of the digital age and the ability to share with people all around the world, I am encouraged to do more. At first when I started photographing at the singings, I took a few pictures which I shared with Judy and when I saw others posting their pictures online, I decided to do so as well. Then I took as I said a few pictures, maybe a dozen or so, but it grew and with the availability of Facebook, the number jumped up to over a hundred at each singing. Judy and I began following the singings in the area of eastern Alabama and western Georgia following our retirement. As we became more interested and could participate somewhat more, we branched out and included most of Alabama and Georgia as singings we would attend. Seeing the various settings for churches, I would include more pictures of the facility and the surrounding area as well as the singers. Judy has difficulty with her vision. She has retinitis pigmentosa. She would ask me who was at the singing and I am terrible with remembering names so I started taking pictures of everyone at the singing. She can remember people well and uses this memory as she does the arranging at singings. I have taken a good many pictures at singings but enjoy taking family pictures even more. I love to take the camera and stroll around parks and towns and take pictures especially in places like walking trails and parks and gardens. From seeing you take photos at singings, I know you are relatively quick to aim and shoot. What prompts you to take a given photo in the moment? I take mostly aim and shoot photos because I would like to think that the pictures offer a commentary on the life of a singing. Many recordings are available of the singings from all the venues around the world and I like to add to the story of what a singing actually is. It is people singing, talking, laughing, commiserating, and celebrating; singings are worship but also a community gathering of people from near and far. People have told me how much they appreciate seeing people who have traveled great distances and others from great distances tell me that when they attend the singings in our area, they feel that they already know the people. So, it is the idea that singings are much more than the songs but it is the whole package that sells the product that I try to add a visual to go with the audio made available from others. As Shane Wootten (center, with book) prepares to call back the class at Liberty, singers scramble through the square to their seats. The directly opposing motion of the figures in the square provide a striking visual composition, and contrast with the orderliness of the four rows of seated tenors in the foreground. 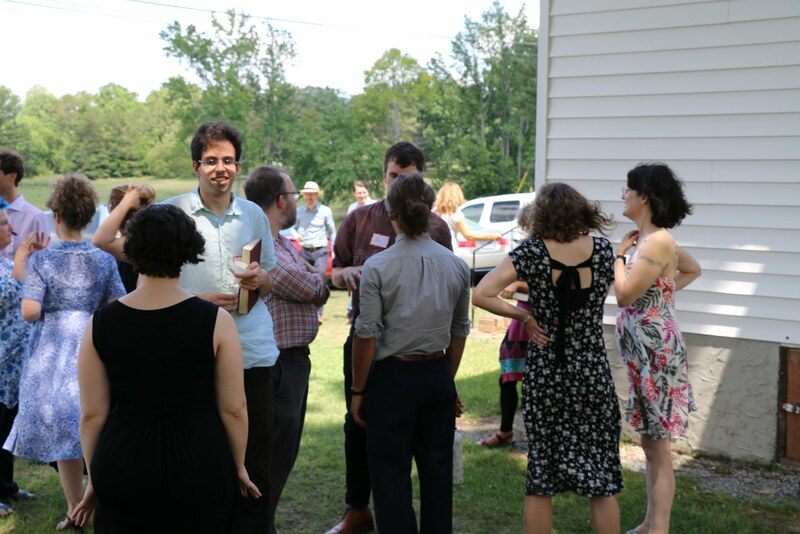 This photo thus captures a precise moment where the free flow of break time gives way to the structure of a singing session, and is a good example of the kind of unorthodox visual imagery required to preserve complex and fleeting aspects of Sacred Harp singing. Photograph by Robert Chambless, taken at the Henagar-Union Convention, July 2, 2016, Liberty Baptist Church, Henagar, Alabama [image 182 of 420]. Many documentary photographers strive to be unobtrusive, or “fly-on-the-wall.” Is it important to you to be unnoticed as you photograph? Or does it not matter? I am not a center-of-attention person, I appreciate talking with people but do not force the issue. I realize that some people find it annoying to have pictures made while most enjoy seeing the pictures. I have had one person ask that no pictures of him be placed on the net, I assume he means other than while he is singing. The negative comments have been very few, at least to me, and the compliments have been many. I hope to continue attending singings and hope to be able to, perhaps, add a little bit to the understanding of what singings are. My sense is that you use the camera as a documenting tool, and that you are content to capture what happens in front of the camera (rather than posing people or waiting for “perfect moments”). Is that fair to say? Do you have particular expectations for what images you want to capture at a given singing? Are you ever especially pleased (or disappointed) with the photographs you’ve taken on a particular day? I enjoy the thought that these pictures may be around for a long time but have no idea how long that may be. I try to include everyone in attendance in a picture whether it be a small group or the whole group. The perfect moment for me is people being people, I drive through towns and see people on the street and think, “Boy, I wish I could stop and take a picture of the person before they change their position and pose.” (Other drivers would probably get mildly upset if someone stopped in front of them and jumped out to take a picture.) I like to see pictures that are clear and descriptive and show some aspect of the event such as singing, birthday party, spring flowers, etc. A poignant image: wonderful singers, beloved friends, and all but one facing away from camera—and photographer. However embedded Robert Chambless is in Sacred Harp, his role as documentarian means he must always stand somewhat outside. Photograph by Robert Chambless, taken at the Henagar-Union Convention, July 2, 2016, Liberty Baptist Church, Henagar, Alabama [image 252 of 420]. Am I correct that you upload all the photos of a singing onto Facebook—that is, every photo you took that day, unedited? This strikes me as an unusual practice and I’m curious how you came to the decision to do that regularly. Generally, when we come home from a singing I know that to do a great deal of preparation with the pictures requires a great deal of time and many people have told me that they enjoy seeing the pictures as soon as possible. I come home, download to the computer, upload to Facebook, and get busy with whatever other activity that might require attention. Sometimes, it may be the next day or so before I actually look at the pictures myself. Have you had interesting reactions to your photos from singers? When people have been sick and unable to attend singings but show up in pictures, many people will say how pleased they were to see the person back at singings and looking well. One or two have asked why I do not do videos of the day, too much involved in that for posting to the web is the reason I give for not doing so. Most just comment that they like seeing the pictures and feeling a connection to those at the singing. The parting hand. The square once again dissolves into individual one-on-one interactions, as we prepare to move from our community of singers back to the wider world. 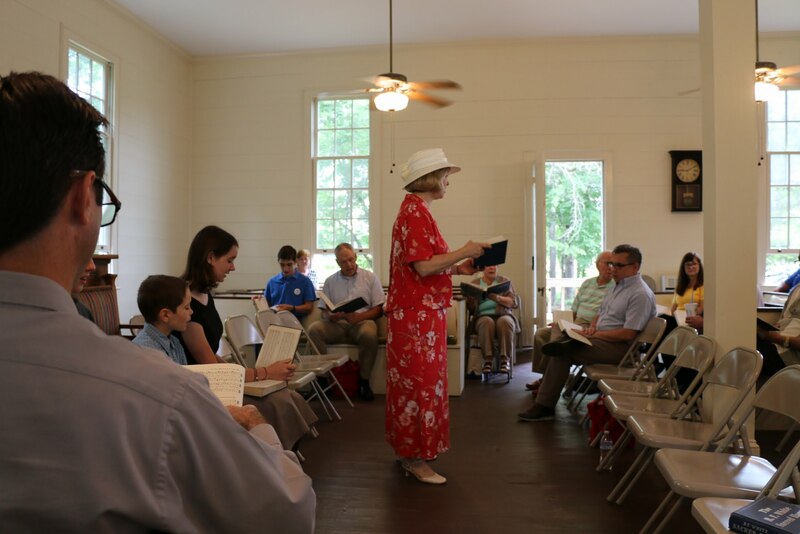 Photograph by Robert Chambless, taken at the Rogers Memorial Singing, March 6, 2016, Ephesus School, Roopville, Georgia [image 348 of 372]. How did you begin singing? I like to sing, I have told this tale many times but here it comes again. When I was a preschooler there was a man who lived near us who had two children a little older than me but he must have heard me singing at some time or another. One day, I was about five I figure, he called me over to where he was and told me that he would give me a piece of Juicy Fruit chewing gum if I would sing him a song. I sang what I knew of the old Chuck Wagon Gang standard “A Beautiful Life” and he gave me the gum. 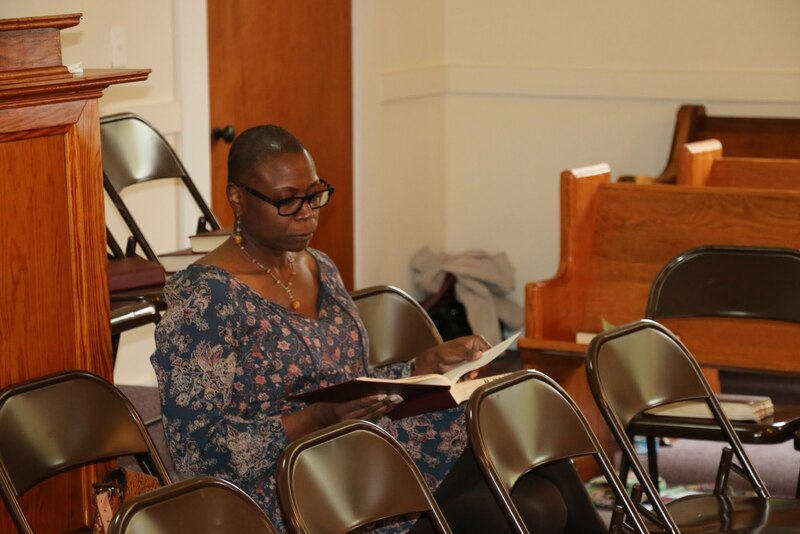 I first saw a moment of [Sacred Harp] singing in 1960 when my family moved to Heflin, Alabama. I remember at some festival, probably 4th of July that year, I was at the courthouse there in Heflin and a group was gathering to sing. Later, I went to Shoal Creek in 1970. I got married in 1971 and my wife to be and I went back to the singing at Shoal Creek so she could see and listen to the music (Judy played the piano in her home church). That time I sat in the bass section, front row, along with the old(er) men who were dressed in suits, I was casual as people are generally today. 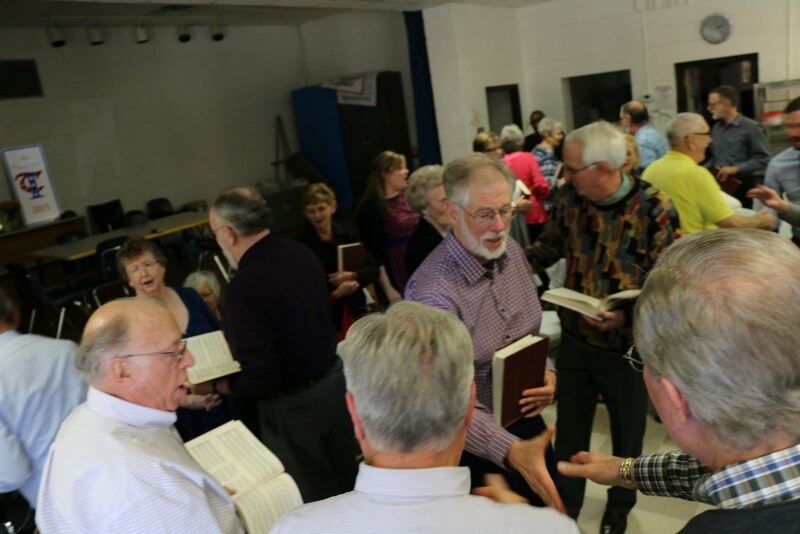 When we decided, after retirement, to take learning and singing the music as a serious hobby and way to involve ourselves with more people, we found that Jeff and Shelbie Sheppard had a singing school down in Anniston, Alabama, once a month. We started attending these schools and singing a few songs with them and grew to like the people who attended these evenings. We began to regularly attend the National Convention in Birmingham, Alabama, and the four-books singings in Montgomery and then more and more from the Atlanta area down to Hoboken, Georgia, to Panama City, Florida, to Henderson, Texas, to Nashville, Tennessee, to Henagar and Ider, Alabama, and singings in that area. Several of the sites where singings were held are no longer supporting the singings, singers grow old and die and the young move to follow jobs and family situations. The thing that keeps me coming back to these singings is the whole picture: people (the wide variety of “types” from atheists to true believers, from straight to gay, different denominations of beliefs, backgrounds and professions, different political views, different races, and other such distinctions which disappear as the people enter the singing site), sites (churches and buildings that we would never have just entered are visited for the singings that are held there, including large modern churches and schools to the old, rustic log churches and State Line Baptist), and music (the challenge to learn something new in the latter stage of life and to come to love the method and the vital nature of the music). The photographer and his wife, Judy. 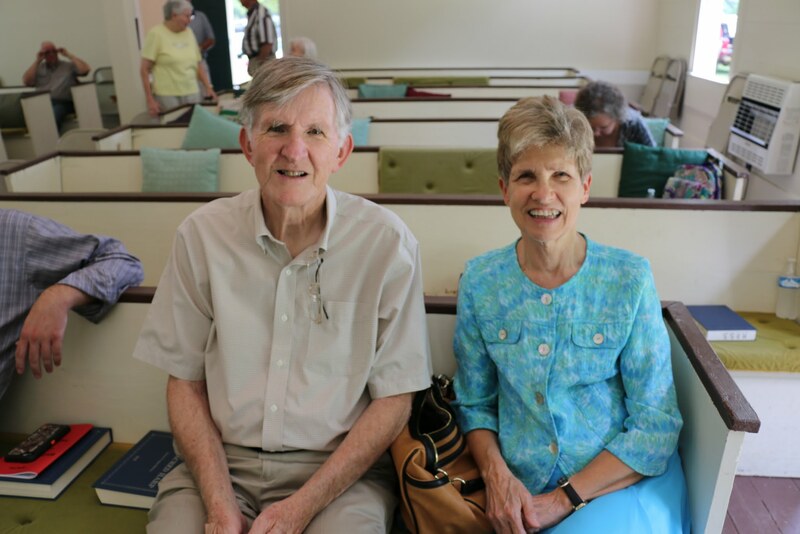 Photo of Robert and Judy Chambless, taken at the Mount Pisgah annual all day singing, May 21, 2016, Mount Pisgah Primitive Baptist Church, Chambers County, Alabama [image 230 of 324]. Photographer unknown. To view Robert Chambless’s photographs of Sacred Harp singings, get in touch with him on Facebook or visit his Google Plus page. Andy Ditzler is a musician, artist, and curator in Atlanta. He began singing Sacred Harp in 2011. He coordinates the Songs Abound series of new shape note compositions and alternative tunebooks. His own songs are on SoundCloud. This entry was posted in Unto the Raptured Eye. Bookmark the permalink.